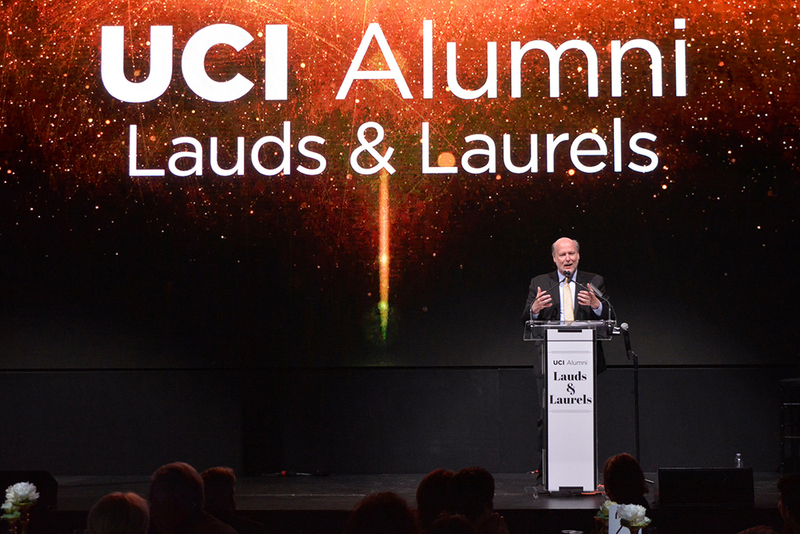 Chancellor Gillman addressed a sell-out audience at the UCI Alumni Association’s 2016 Lauds and Laurels celebration on Thursday, May 12. Alumni from each of UCI’s schools were honored, along with faculty, staff and students. The chancellor introduced the winner of the association’s highest honor, the Extraordinarius Award, Dr. Michael Clark, M.A. ’73, Ph.D. ’77, vice provost for academic planning and professor of English. Clark was instrumental in creating the UCI School of Law, planning and obtaining approvals in its earliest stages. His thorough work is credited with helping the school obtain full accreditation from the American Bar Association only five years after opening its doors.